1 A None No Power Seat 1 A is a Business Class Bulkhead seat that is very private as the single seat faces away from the aisle and in towards the window. 1 G None No Power Seat 1 G is a standard Business Class Bulkhead seat. 1 K None No Power Seat 1 K is a Business Class Bulkhead seat that is very private as the single seat faces away from the aisle and in towards the window. 15 A None No Power Seat 15 A is a standard Premium Economy Bulkhead seat. There may be no storage during take-off and landing. The tray table may be in the armrest, making the armrest immovable and slightly reducing the seat width. 15 C None No Power Seat 15 C is a standard Premium Economy Bulkhead seat. There may be no storage during take-off and landing. The tray table may be in the armrest, making the armrest immovable and slightly reducing the seat width. 15 D None No Power Seat 15 D is a standard Premium Economy Bulkhead seat. There may be no storage during take-off and landing. The tray table may be in the armrest, making the armrest immovable and slightly reducing the seat width. 15 F None No Power Seat 15 F is a standard Premium Economy Bulkhead seat. There may be no storage during take-off and landing. The tray table may be in the armrest, making the armrest immovable and slightly reducing the seat width. 15 G None No Power Seat 15 G is a standard Premium Economy Bulkhead seat. There may be no storage during take-off and landing. The tray table may be in the armrest, making the armrest immovable and slightly reducing the seat width. 15 H None No Power Seat 15 H is a standard Premium Economy Bulkhead seat. There may be no storage during take-off and landing. The tray table may be in the armrest, making the armrest immovable and slightly reducing the seat width. 15 K None No Power Seat 15 K is a standard Premium Economy Bulkhead seat. There may be no storage during take-off and landing. The tray table may be in the armrest, making the armrest immovable and slightly reducing the seat width. 16 G None No Power Seat 16 G is a standard Premium Economy Class seat. 16 H None No Power Seat 16 H is a standard Premium Economy Class seat. 16 K None No Power Seat 16 K is a standard Premium Economy Class seat. 17 A None No Power Seat 17 A is a Premium Economy Class seat where the close proximity to the lavatories behind may be bothersome. 17 C None No Power Seat 17 C is a Premium Economy Class seat where the close proximity to the lavatories behind may be bothersome. 17 D None No Power Seat 17 D is a Premium Economy Class seat where the close proximity to the lavatories behind may be bothersome. 17 F None No Power Seat 17 F is a Premium Economy Class seat where the close proximity to the lavatories behind may be bothersome. 17 G None No Power Seat 17 G is a Premium Economy Class seat where the close proximity to the lavatories behind may be bothersome. 17 H None No Power Seat 17 H is a Premium Economy Class seat where the close proximity to the lavatories behind may be bothersome. 17 K None No Power Seat 17 K is a Premium Economy Class seat where the close proximity to the lavatories behind may be bothersome. 20 A None No Power Seat 20 A is an Economy Class Exit Row seat that may have extra legroom, however the close proximity to the lavatories may be bothersome. The tray table may be in the armrest, making the armrest immovable and slightly reducing seat width. There may be no floor storage during take-off and landing. 20 B None No Power Seat 20 B is an Economy Class Exit Row seat that may have extra legroom, however the close proximity to the lavatories may be bothersome. The tray table may be in the armrest, making the armrest immovable and slightly reducing seat width. There may be no floor storage during take-off and landing. 20 C None No Power Seat 20 C is an Economy Class Exit Row seat that may have extra legroom, however the close proximity to the lavatories may be bothersome. The tray table may be in the armrest, making the armrest immovable and slightly reducing seat width. There may be no floor storage during take-off and landing. 20 D None No Power Seat 20 D is an Economy Class Exit Row seat that may have extra legroom, however the close proximity to the lavatories may be bothersome. The tray table may be in the armrest, making the armrest immovable and slightly reducing seat width. There may be no floor storage during take-off and landing. 20 F None No Power Seat 20 F is an Economy Class Exit Row seat that may have extra legroom, however the close proximity to the lavatories may be bothersome. The tray table may be in the armrest, making the armrest immovable and slightly reducing seat width. There may be no floor storage during take-off and landing. 20 G None No Power Seat 20 G is an Economy Class Exit Row seat that may have extra legroom, however the close proximity to the lavatories may be bothersome. The tray table may be in the armrest, making the armrest immovable and slightly reducing seat width. There may be no floor storage during take-off and landing. 20 H None No Power Seat 20 H is an Economy Class Exit Row seat that may have extra legroom, however the close proximity to the lavatories may be bothersome. The tray table may be in the armrest, making the armrest immovable and slightly reducing seat width. There may be no floor storage during take-off and landing. 20 J None No Power Seat 20 J is an Economy Class Exit Row seat that may have extra legroom, however the close proximity to the lavatories may be bothersome. The tray table may be in the armrest, making the armrest immovable and slightly reducing seat width. There may be no floor storage during take-off and landing. 20 K None No Power Seat 20 K is an Economy Class Exit Row seat that may have extra legroom, however the close proximity to the lavatories may be bothersome. The tray table may be in the armrest, making the armrest immovable and slightly reducing seat width. There may be no floor storage during take-off and landing. 28 A None No Power Seat 28 A is a standard Economy Class seat that is missing a window. 30 A None No Power Seat 30 A is an Economy Class seat that may be misaligned with the seats in front. This potential misalignment may interfere with your legroom. 30 C None No Power Seat 30 C is an Economy Class seat that may be misaligned with the seats in front. This potential misalignment may interfere with your legroom. 30 H None No Power Seat 30 H is an Economy Class seat that may be misaligned with the seats in front. This potential misalignment may interfere with your legroom. This seat may also have limited recline. The close proximity to the galleys may be bothersome. 30 K None No Power Seat 30 K is an Economy Class seat that may be misaligned with the seats in front. This potential misalignment may interfere with your legroom. This seat may also have limited recline. The close proximity to the galleys may be bothersome. 31 A None No Power Seat 31 A is an Economy Class seat in the last row of the plane. This seat may have limited recline and the close proximity to the galleys behind may be bothersome. 31 C None No Power Seat 31 C is an Economy Class seat in the last row of the plane. This seat may have limited recline and the close proximity to the galleys behind may be bothersome. 31 D None No Power Seat 31 D is an Economy Class seat in the last row of the plane. This seat may have limited recline and the close proximity to the galleys behind may be bothersome. 31 F None No Power Seat 31 F is an Economy Class seat in the last row of the plane. This seat may have limited recline and the close proximity to the galleys behind may be bothersome. 31 G None No Power Seat 31 G is an Economy Class seat in the last row of the plane. This seat may have limited recline and the close proximity to the galleys behind may be bothersome. 5 D None No Power Seat 5 D is a Business Class seat where the close proximity to the galley behind may be bothersome. 5 G None No Power Seat 5 G is a Business Class seat where the close proximity to the galley behind may be bothersome. 6 C None No Power Seat 6 C is a Business Class Bulkhead seat where the close proximity to the lavatories and galley may be bothersome as this seat faces outwards into the aisle. 6 F None No Power Seat 6 F is a standard Business Class Bulkhead seat. 6 H None No Power Seat 6 H is a Business Class Bulkhead seat where the close proximity to the lavatories and galley may be bothersome as this seat faces outwards into the aisle. Personal Touch Screens with AVOD are available at every seat with 12.1" monitors in Business Class, 10.6" monitors in Premium Economy, and 10" monitors in Economy Class. 110V AC powerports are available at every seat in every class. USB ports are located at every seat on this aircraft. 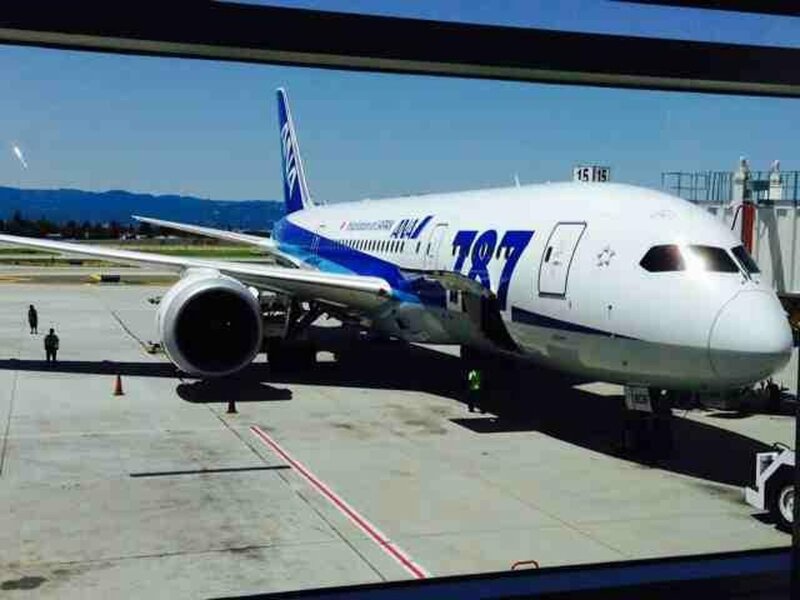 This Boeing 787-8 is one of four different versions of ANA's 788 aircraft. This version is configured in a three class layout with 46 flat-bed Business Class seats, 21 Premium Economy seats, and 102 Economy Class seats. This is a window seat in the very last row of the plane. There is a nice wide space between the seat and the window. It's large enough to place your bag and other belongings in, and technically wide enough for you to exit the row as there's nobody behind you (but there are signs telling you not to do this). You don't get that claustrophobic, enclosed feeling that you would elsewhere in economy. The only bad part is that the galley is right behind you and the lights are always on, so you might not get much sleep. Also, you'll be the last one off the plane. This is an aisle seat in the exit row, which does provide extra legroom, and the other passengers in the row can easily get past you. However, with the lavatories close by (right in front of you) a crowd always gathers around this area. Some people will actually stand in that space in front of you while waiting. If you stretch your legs out, your feet are sure to be bumped. These aren't marked as premium seats, so they don't cost extra. For that reason, I believe the pros still outweigh the cons. I flew this aircraft on the 10 hr 50 min flight from San Jose to Tokyo Narita and found it to be very comfortable. Unlike other reviewers, I found the seat to be very comfortable. The legroom is adequate and the seat width is just enough. I also enjoyed the addition of a foot rest. The IFE was excellent. There were plenty of movies to watch and I enjoyed the intricate map. Service is what you'd expect of a five-star airline. 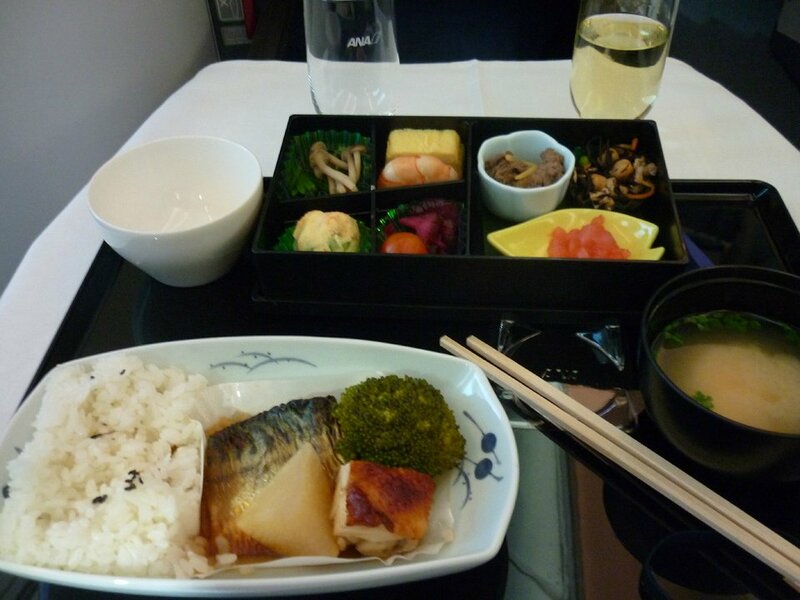 The food was very good for airplane food, much better than the food on United. The flight attendants were very friendly, and were always smiling. Overall, a top-notch experience for a five-star airline. Thank you ANA! VERY bad seat. (1.) 3-3-3 arrangement is an insult to the traveller, since the plane was engineered for 2-4-2. Incredibly cramped. (2.) Seat does not recline, and slides only about 1.5 cm. Absolutely miserable for a red-eye flight. (3.) No overhead bins for D-F-G seats, Rows 28-31. Bottom line: ALL economy 3-3-3 should go yellow on account of miserable seat width. Rows 28-31 D,F,G should be red on (additional) account of no overhead storage bins. Photos attached to document. Note that there is no overhead luggage storage for Rows 28-31 D/F/G seats. It seems that cabin crew quarters above extend down into the bin space. There are panels that make it look like a standard OH bin, but they don't open. Foot space is greatly reduced due to the electrical box servicing this row. The G seat has no obstruction. I was in seat 12A, a proper window seat in business; I was originally in 11A, but like many on the flight, changed to the even seat. The even business seats have proper window access, the odd "window" seats have aisle access and one must reach around the seat to access the window. This over wing seat seems to have more engine noise than seats at the very front. It is not a particularly loud aircraft however. This seat was the last business seat before economy plus. This does mean there is a window close behind that is unreachable. Fortunately when the lights are lowered it is dimmed by the crew. The pull out table comes from under the screen in front and is much better than most, allowing multiple seating angles and leaving some room. Many business tray tables require the seat to be fully upright and leave little room because they come from the side. The power options are well thought out being right above the table. The amenities including slippers and top quality toiliets are excellent. The TV screens are 17 inch and well placed. Short comings: Ipod or phones can be used through the entertainment system, but only with a max of 5Gig of storage. Who has that little storage these days? Noise canceling headphones are provided, but they aren't as nice as mine, however ANA persists with the two odd prong audio connection. A horrid adapter used nowhere else. Thus, without my adapter, my headphones couldn't be used. One thing that is not mentioned enough are the large windows which dim electronically. They provide a more open feel to the aircraft. It also ensures that the crew can dim the cabin, without worry of someone being inconsiderate and leaving a window open ruining everyone's sleep. The higher cabin pressure also means that I didn't find myself as exhausted or dehydrated after the flight as on other aircraft. The 787 is worth considering when chosing a flight. Per some other comments on this plane, the 3-3-3 economy class configuration is very cramped and has narrow seats for long haul travel. I flew on it for 10 hours from SEA to NRT and it was greatly inferior to the 777. I was travelling with my wife and baby daughter. The bassinet is fitted lower due to the bulkhead shape which makes it very awkward to manage a baby. Disappointing overall despite the excellent help and attention from ANA flight attendants. It's a pity that ANA did not think more cleverly about the design of the interior of this plane. I will avoid it in future. ANA flight between SJC and NRT used to have planes with economy seating configuration of 2-4-2, which was comfortable. Now this 3-3-3 configuration is really crammed and has very little leg room. The person in front of me had her seat down most of the time except for meal service. It was one of the most uncomfortable flight. ANA flies 3 versions of Boeing 787-800 .